Four receiver spots are set and Arrelious Benn is projected to make the roster as a special teams contributor. 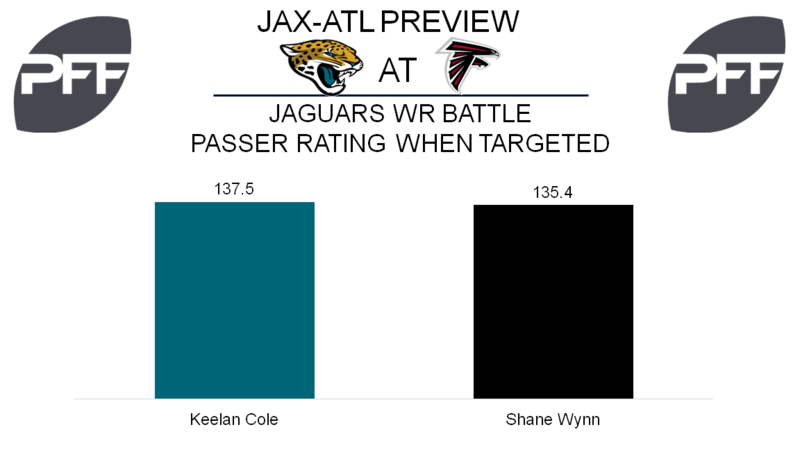 Cole impressed in the Jaguars’ first preseason game, but has since hauled in three of his six targets including two crucial drops. That lowered his overall preseason grade to 50.7 on 86 snaps. Cole is still averaging 2.87 yards per route run, and Jaguar quarterbacks have a passer rating of 137.5 when targeting him. Wynn has the higher overall grade of the two this preseason, 75.1 overall on 58 snaps. Through three preseason games, Wynn has hauled in six of his eight targets with no drops and is averaging 1.87 yards per route run in the slot, compared to 1.50 overall. Jaguars quarterbacks have posted a rating of 135.4 when targeting Wynn. Patmon an undrafted free agent in 2014, has played for the Cowboys and Dolphins and spent 2016 on practice squads. His overall grade of 82.0 on 115 snaps is the highest among Jaguar cornerbacks this preseason. Patmon has allowed a reception once every 13.8 snaps in coverage and 0.75 yards per coverage snap. Myrick, a seventh-round pick this past April, is on the bubble. Through 75 snaps, he has an overall preseason grade of 38.3. While Myrick has allowed 1.32 yards per coverage snap, he has fared better against the run with an overall grade of 72.0. The Jaguars initially wanted to utilize Myrick’s 4.28 speed as a punt returner, but that hasn’t happened yet making it a situation worth monitoring on Thursday. Brandon Allen: With an overall grade of 77.4, Allen is the Jaguars quarterback with the highest overall grade this preseason. On 15 dropbacks when pressured, Allen has an adjusted completion percentage of 60.0, and a passer rating of 101.0. On the 17 drop backs where Allen was kept clean, he has a passer rating of 126.0, and an adjusted completion percentage of 71.4. With the top spot unsettled last week, Allen only played six snaps last week, but should see plenty more on Thursday. Garland and Schweitzer have been battling all preseason long and the battle figures to carry over into the final tune-up Thursday against the Jacksonville Jaguars. 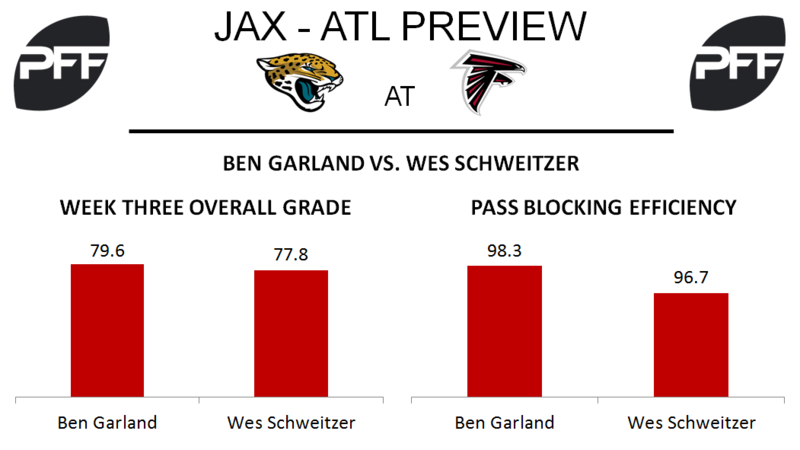 Garland had a slightly better game than Schweitzer last week against the Arizona Cardinals, earning a game grade of 79.6 compared to Schweitzer’s game grade of 77.8. Schweitzer drew the start for the second week in a row in Atlanta’s third preseason game. Despite drawing the start, Schweitzer only got two more snaps than Garland. Both Schweitzer and Garland finally had a blemish on their pass-blocking efficiency as Schweitzer allowed two pressures dropping his PBE to 96.7, while Garland allowed one pressure dropping his PBE to 98.3. Duke Riley, LB- The Falcons’ third-round pick in the 2017 draft has played the fifth-most defensive snaps of all Falcons defenders so far this preseason. Riley has earned a run-stop percentage of 8.8 percent, which ranks 35th among 4-3 outside linebackers so far this preseason. Reggie Davis, WR- Davis comes to the Falcons as a UDFA out of Georgia and has had a strong preseason thus far. He figures to be fighting for one of the last few roster spots and is the highest graded receiver on the Falcons (minimum 30 snaps). Davis has also earned a 118.8 wide receiver rating through three preseason games.